Argentenay Point (Pointe Argentenay), a magnificent piece of land covering more than 74 acres (30 hectares), is located on the east end of the île d’Orléans. 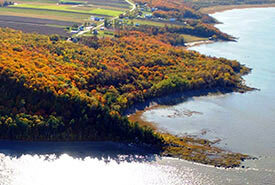 The 14-hectare riverside property, protected by NCC, affords one of the nicest views of the Saint Lawrence River. The whole of Argentenay Point is covered by an exceptionally rare forest ecosystem, home to old red oaks and American beech, among other species. Several species at risk can also be found there, including butternut, an endangered species in Canada, as well as two at-risk plant species, namely two-leaved toothwort and large toothwort. Moreover, the site is an important stop for migrating birds and is visited by snow geese, black ducks and several other species of waterfowl. The area’s rocky and grassy shores provide grounds for breeding, feeding and shelter for a wide variety of species. The shorelines represent essential habitat for Victorin’s gentian, a plant that is threatened in Quebec and whose range is limited to the Saint Lawrence estuary. In 1650, Olivier Letardif, court judge for the Côte-de-Beaupré seigneurie, granted the point of île d’Orléans to Louis d’Ailleboust. D’Ailleboust, who held the title of Argentenay, gave this name to the estate. Toward the end of World War II, Paul-Henri Guimont and Georges Raoul Lafrance discovered the Argentenay Point area during a car trip on île d’Orléans. Over the following years, their respective families acquired this magnificent property. They enjoyed the natural beauty of its landscape while making plans for the future of the point. It was in 2013 that the Guimont and Lafrance families called on the Nature Conservancy of Canada (NCC) to help ensure the long-term protection of this unique natural legacy. Today, it is possible to access Argentenay Point via the Scouts campground from mid-June until the end of August. North of the point is a belvedere, from which one can take in the point itself, the Saint Lawrence, the neighbouring islands, Cap Tourmente and the Laurentian mountains on the horizon.